The new owners of a stone manor in Weston wanted its grand entry to feel less institutional and more residential. “Because it was such a voluminous space, we wanted to make it seem more human-scale,” says Thomas Catalano, president of Catalano Architects. But how do you make a room with soaring ceilings and oversize windows feel cozy? By adding furniture in the same proportions—in this case, a Yamaha grand piano. 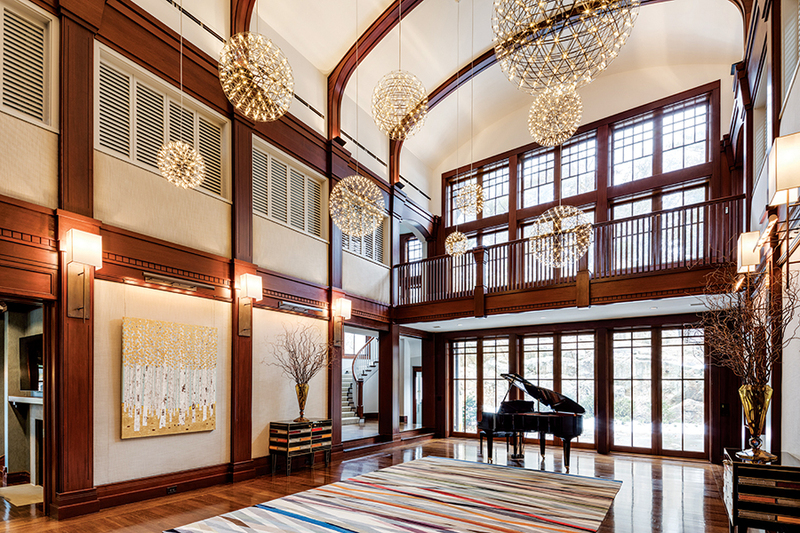 The design team also installed stainless steel sphere lighting from Moooi to accentuate the room’s original mahogany finishes, as well as a colorful rug to create the comfortable, welcoming environment the homeowners dreamed of. “It’s a playful intervention in a more or less very serious space,” Catalano says.